A particularly active spring storm season left pockmarked roofs and tumbled fences throughout North Texas this year, including many in my master-planned community, thanks to an EF0 tornado that blew its way through the neighborhood (thankfully missing my house – this time). The process of repairs and replacements was as fickle as the tornado itself. Some homeowners received immediate or at least prompt approval from the community Homeowners’ Association (HOA) and its Architectural Review Committee (ARC), while others were forced to wait and wait and wait – which would be frustrating, even if this weren’t the wettest June in 13 years. In one case, a homeowner’s approval was inexplicably delayed so long, even though she was only looking to replace her damaged roof with the exact same roof, that she suffered leaks and damage to the interior of her home. That’s one of the rubs of living in a community that is governed by an HOA: You need approval to do stuff to your house, even if that stuff is going to be an improvement over what it currently looks like. It’s not the only potential downside, but there are also plenty of advantages associated with an HOA. And with more than 40 million U.S. households “or 53% of the owner-occupied households in the America” living with an HOA, according to HOA-USA – a number that’s on the rise with new construction, of which more than 60% have an HOA – it’s something you might have to deal with. Get to know the pros and cons so there won’t be any surprises. Con: Limits your creativity and individuality. HOAs may offer limited options when it comes to updates. Older neighborhoods may have a small color palette available to owners and may be reluctant to expand it to current trends. Con: Those restrictions can be Confining. An HOA demands that you ask permission before making any changes to your home – even if you’re just talking about staining your fence the very same color. Depending on how finicky your HOA is, you might also get fined because your landscaper took the week off or because the basketball net in your driveway is torn (true story). Pro: File this under the umbrella of “protecting your investment.” Many HOAs have stipulations about how many cars, or what type, can be parked on your property, or even where they can be parked. That can help ensure that the neighbor down the street doesn’t turn his lawn into an auto body shop with multiple non-functioning cars up on blocks. Con: Looking to park your RV or boat in your driveway? An HOA may nix that idea. Be sure you check ahead of time to make sure this is allowed. Pro: An HOA decision may not be final. 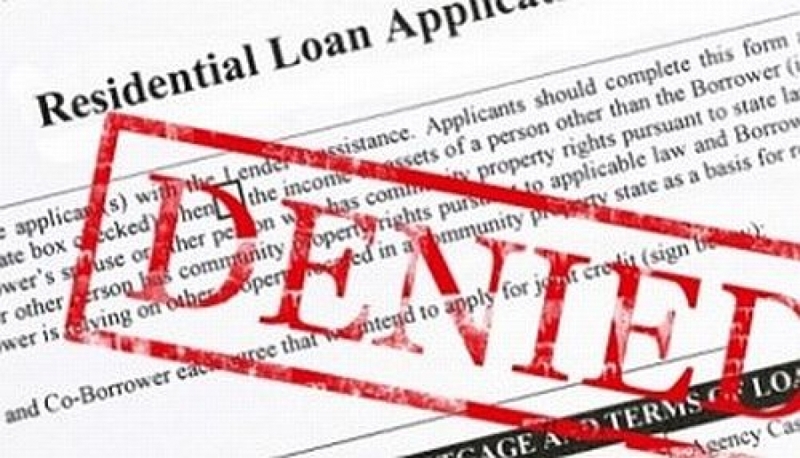 Get a rejection from the HOA on your submitted request to make changes to your landscaping? You can always appeal and state your case. Con: Deciding to “ask for forgiveness instead of permission” rarely goes well, so, if you decide to go ahead with changes despite not receiving an approval from the HOA, beware: You might be fined. Pro: Some HOAs take care of things like your front-yard landscaping and trash removal, which means you don’t have to pay for it or worry about it. Con: That also may mean strict restrictions about what you can and can’t plant in your front yard. You may have to reconsider those rose bushes. Pro: You might not have to put in a pool because there’s one in the community that you’re helping to pay for through your HOA dues, but don’t have to maintain. Con: When the pool needs to be redone, it’ll be you and all your neighbors that are on the hook to pay for it – even if you never use it. Pro: A pool is just the beginning. 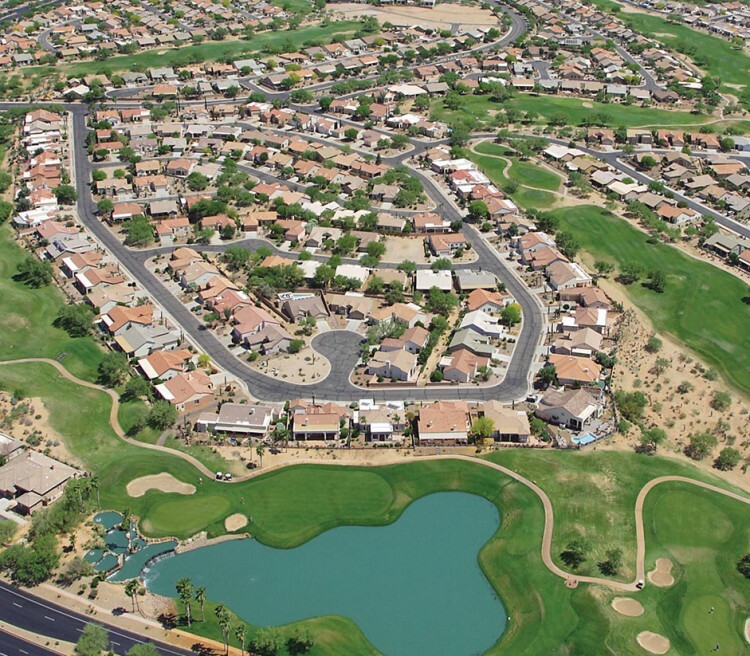 Planned communities with an HOA can have golf courses, tennis courts, clubhouses, playgrounds, and even private lakes for fishing and recreation. Con: The more amenities you have, the more you’re likely to pay in HOA dues. In a large masterplan with a couple of pools, a playground, and a tennis court, you can pay as little as $50 per month. The more homes that are added, the more the overall cost is spread out. A more “typical range” is $200–400 per month, said Investopedia, adding that, “The more upscale the building and the more amenities it has, the higher the homeowners’ association fees are likely to be.” In some condos, the fees may be higher if parking and security are considerations, and, especially, in a luxury building with amenities including a fitness center and concierge. “Hollywood’s fancy Sierra Towers condo building, which is filled to the brim with amenities like 24-hour concierge service and valet parking. They charge residents of a 3,400-square-foot condo about $4,000 per month in HOA fees,” said Realtor.com. Pro: You’ve got a built-in mediator. “Involved in a tiff with your neighbor over that big oak tree that’s losing limbs? You can settle some confrontations with your neighbors by taking your grievances to the HOA’s board or management company,” said RISMedia. Con: Maybe you’re the type that wants to “handle” grievances in your own way? Pro: Some HOAs allow you to pay monthly, quarterly, or annually. Pro: Part of what you’ll pay to the HOA every month goes to a reserve fund, which can be used for neighborhood repairs and emergency needs. Con: The reserves may not be enough to cover large expenses. “In addition to monthly fees, if a major expense such as a new roof or a new elevator comes up and there aren’t enough funds in the HOA’s reserves to pay for it, the association may charge an extra assessment that can run into thousands of dollars,” said Investopedia. How often do you hear someone say that? What they mean is they can’t wait to be in their new place, all unpacked and organized and enjoying their new surroundings. Proper preparation can help you ward off many of the issues that can turn a move into a nightmare, and that’s starts with a healthy dose of research. You always want to ask for a referral rather than using an unknown. And not just anyone is qualified to give a referral, according to MSN. “Check with your area’s Better Business Bureau to see if any complaints have been filed and whether there are reliable,” they said. 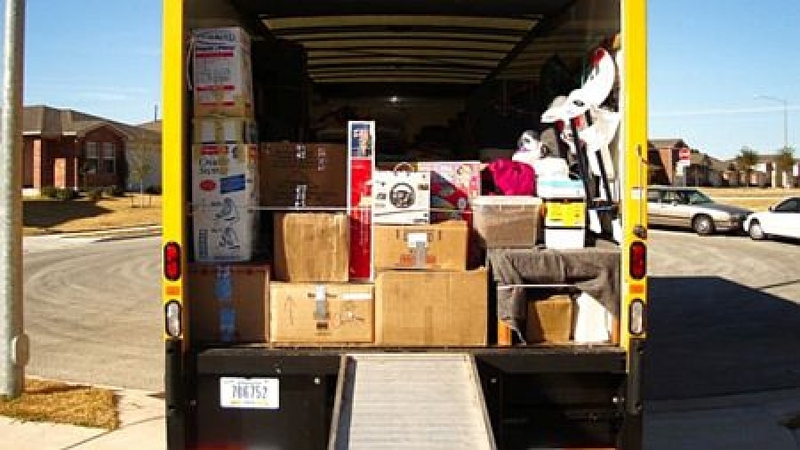 “You get what you paid for” is often a dangerous reality when it comes to moving. To protect yourself against unethical movers, get several estimates and make sure to weed out any that seem too low. Yes, the desire to save money is strong. But an unusually low bid is often a red flag. No matter how well you prepare, the unexpected can still happen. What if the truck doesn’t show up on time? Are you prepared to live without your things for a few days, or longer? Make sure you pack a bag of essentials you can have with you while the rest of your stuff is stuck on the truck. It’s a new season with new trends, so you might be in the market for new patio furniture, or your old furniture just needs some updating. Chances are your cushions and pillows are looking faded, worn out and tattered from last year, so replace them with new cushions or fabric covers to match the rest of your decor. Don’t be afraid to go with bold and bright colors or big designs because they won’t dominate the area since it’s an open space. You also need enough furniture and seating to fit your family and friends. Get a large round table or a long rectangular table for your guests to eat, snack and set down their drinks. Add extra chairs or a love seat around your table so you can add more people than your immediate family when you host a party. Go for items that are easy to clean so dust, dirt and spills don’t permanently ruin your furniture. The summer sun can be intense, so you need shady areas to give yourself and your guests a break. Get a table with an umbrella in the middle to provide some shade while you’re eating dinner on the patio. Or add an umbrella on the top step of your pool or behind lounge chairs to stay cool. If you want a larger shady area, set up a pavilion with a canopy roof in a section of your yard. Add chairs, side tables and a reading area underneath. You also can build a pergola and cover the top and sides with growing vines or climbing plants. This will add some color and nature to your patio as well as provide you with shade. 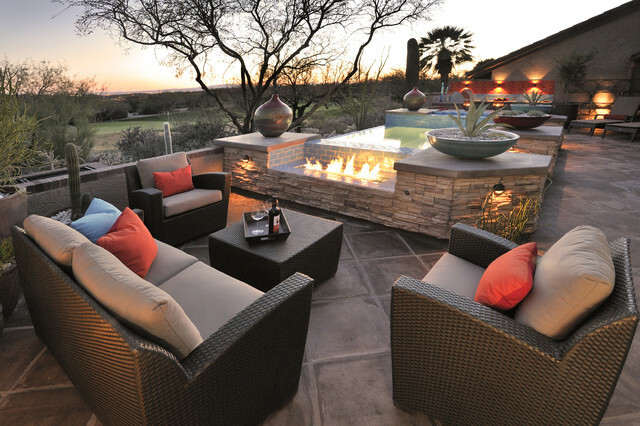 Transform your patio into a summer wonderland by lighting it up at night. Once the sun goes down and the temperature drops, you’ll want to relax on your patio with a nice cocktail or dessert with a lovely glow around you. For a touch of glamour, install an outdoor chandelier or light fixture over your patio table and chairs. String up hanging lights from the roof and side of your pergola to light up your ivy or plants. Put a few candles in translucent vases on side tables surrounding your other furniture or in the middle of your table. This is a great place for you to include some of your accent colors and add a delicate touch to sometimes bulky furniture. Now that you have the necessities, it’s time to get to the fun part. You want people to see your beautiful summer patio, so give them an excuse to come over for a party. Set up a grill, cooler for drinks and counter space to prepare and display your summertime treats. If it tends to get cool at night, get a table with a fire pit in the middle or build your own fire pit where you can roast s’mores and tell ghost stories. You also should invest in some lawn games and board games that you can play well into the night. 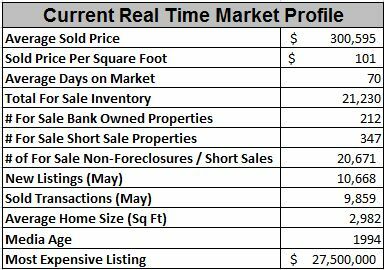 The current real time market profile shows there were approximately 10,513 new listings (up 155 listings from last month) on the market in May 2017 and 9,859 sold transactions (up 494 listings from last month). The overall inventory of homes on the market in May 2017 is 21,230 homes (down 576 listing from last month) which is down -26.2% as compared to the number of home on the marker in May 2014. In May 2015 there were 24,410 homes, in May 2014 there were 28,776 homes and in April 2013 there were 19,462 homes for sale on the market. 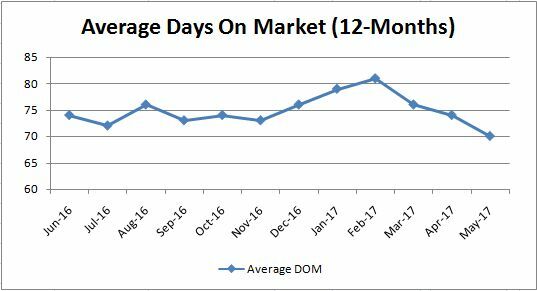 Due to the large spike in the number of sold transactions and the decline in average days on market this shows buyer’s demand is strong where inventories may continue to be low and drive up prices. 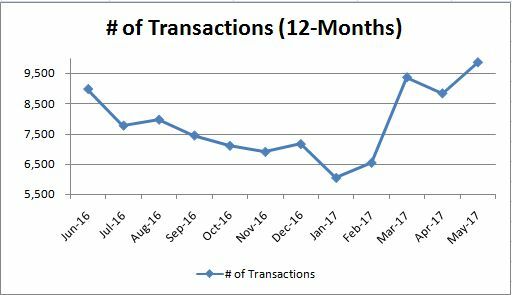 Since November 2016 after our new president took office the average sales price has increased from approximately $281,000 to $300,000 or an appreciation rate of 6.8% and the number of sold transactions has increased from approximately 6,898 to 9,859 transaction or an increase of 42.9%. From April to May the average sold price has increased approximately 2.8%. 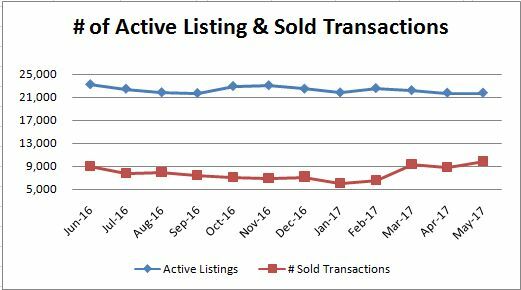 The number of sold transactions usually starts to decrease in July due to summer vacations but we will have to see next month if buyer demand will continue to follow the usual trend. 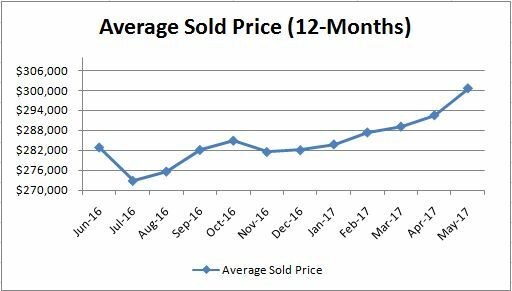 Since June 2016 (12 months ago), the average sold price has increased +6.3% (up from last month), the average days on market has decreased approximately -5.4% (down from last month) and the number of sold transactions has decreased approximately +9.8% (up from last month). 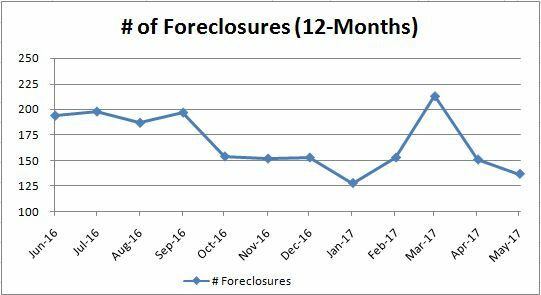 The volume of foreclosure purchases since June 2016 (12 months ago) has decreased approximately -29.4% and the volume of short sales decreased of approximately -19.5%. 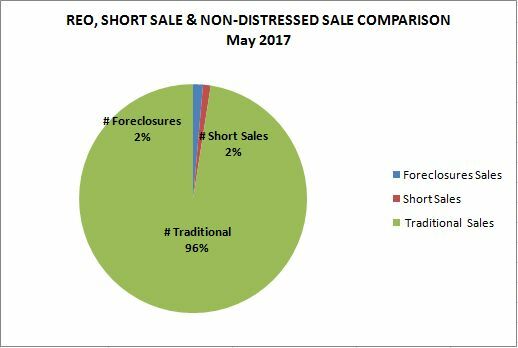 The current percentage of foreclosure sales and short sales sold is only 2% of the market which indicates a healthy market. Unfortunately, there are still some homeowners who bought between 2005 and 2007 that are still up-side-down as shown in the yearly average sold price chart above. Since June 2016 (12 months ago), the number of homes for sale on the market have decreased approximately -8.9% or 23,298 homes for sale on the market to a gradual decrease of 21,230 homes (Down 576 homes from last month). The total number of listings is low as compared to 29,308 listings in August 2014. 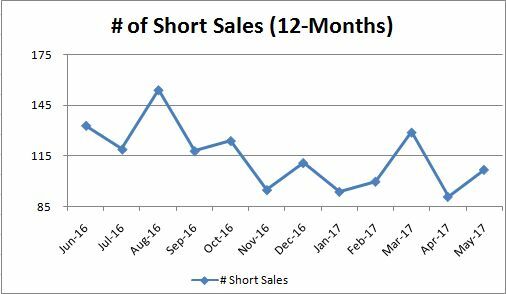 This decrease in the number of homes for sale indicates we are currently in a seller’s market (low supply and increased demand). Real estate prices are still relatively low (near 2008 prices), interest rates are planned to increase in 2017 and the macroeconomic market is improving both in terms of prices and the overall economy. Give us a call to discuss your best buying or selling strategy, TODAY! !